Warehouse Sale that I've been waiting for!! Been googling about this since yesterday and I was right to come here at 4PM. There's still plenty of space that I could move around (I could breakdance if I know how to) and no queue at the cashier. 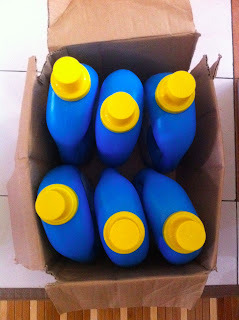 I am shopping like a mad person when I saw my target today - liquid detergent!! 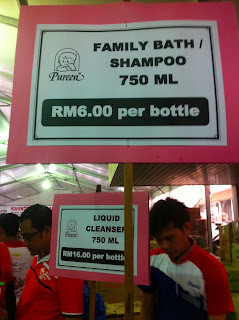 Then I saw the liquid cleanser, RM11 per packet. 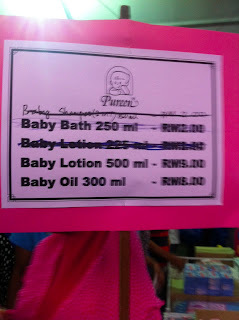 Same price with Mom&Baby Expo in Midvalley early this month. So, not that intriguing. In case you didn't know, the cheapest that I bought is during Motherhood Expo in March at KLCC - RM11 for twinpack. 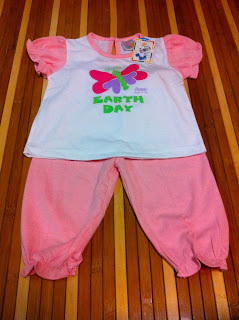 I remember cause I snapped the picture ;) That's the best deal, yo! Mission accomplish in 5 minutes but since the place wasn't crowded, so I decided to check out few cloths for Rauhah where I spent mostly of my time search for the cloths at the counter. Got a few good catch though I only manage to grab the one RM3 per piece cloths. A tip when buying cloths here, instead of choosing one by one at the counter, go make friends with people who are standing behind the bar (Pureen staffs) cause they will give you a bag of unwanted cloths that they didn't store back at the counter. 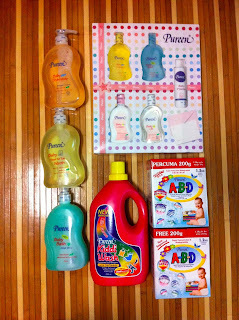 The thing when buying at the warehouse sale is that you have to know the price of the item - not only at the market price but also promo price during other baby expo. 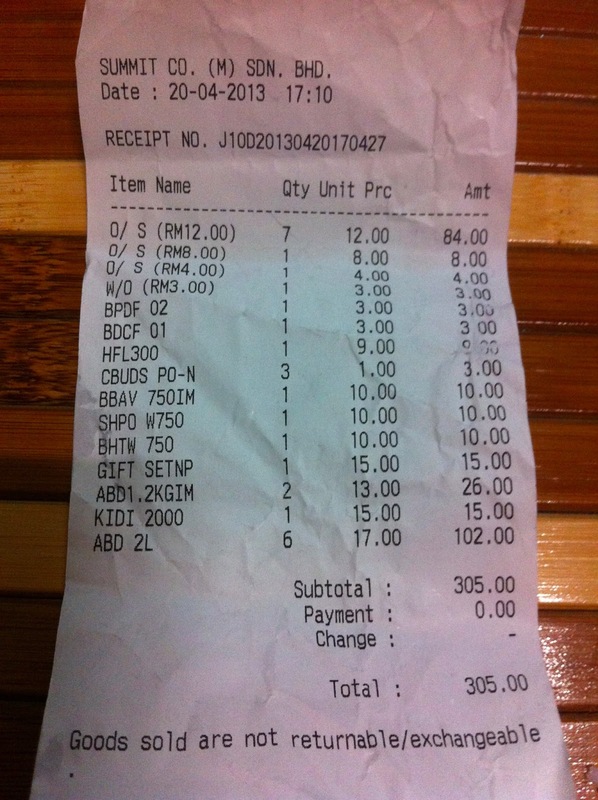 For example, you'll go crazy over RM9 wetwipes sampai berlaga2 bontot siku bagai, sanggup demi RM9 tuh. 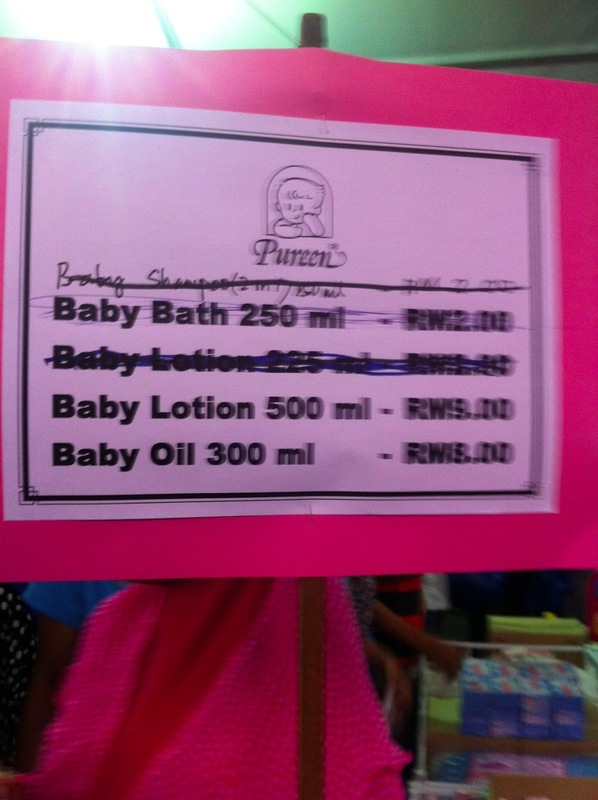 Padahal, you could get the exact same price at any baby expo. Ye, tak tipu. Pureen wetwipes tu memang RM9 kat Mom&Baby expo and Motherhood Expo. So takyah kiasu yang tu. 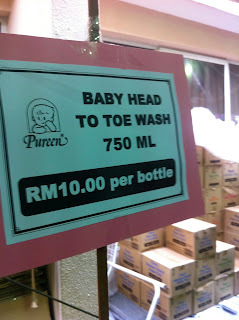 Ala.. baby expo ni selang sbulan ade. 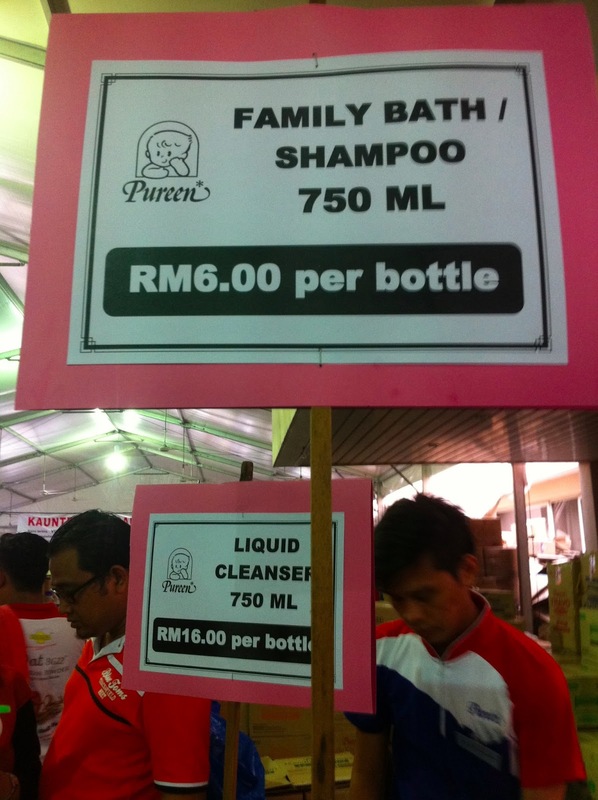 Anyhow here's some price reference - I didnt capture ABD liquid detergent price but it has increased by RM1 from last year. 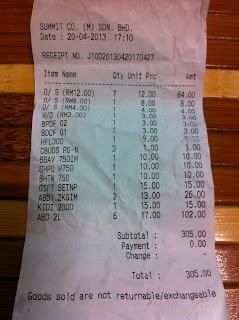 It was RM16 previously. 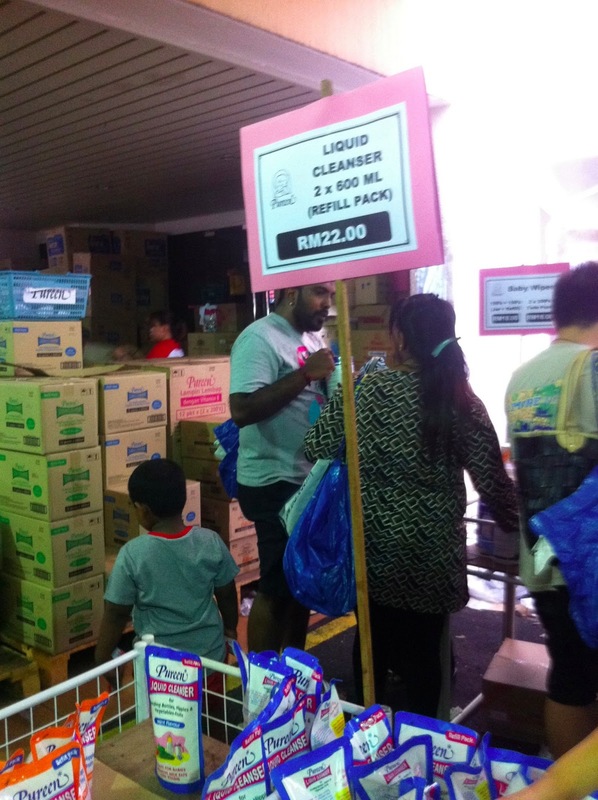 I spent one hour here and the crowd started to full at cashier by 5PM. 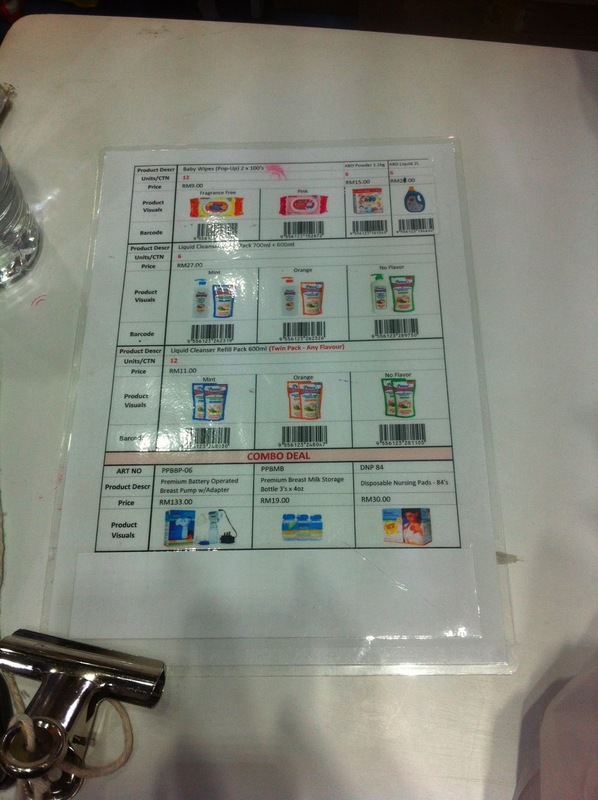 I am a little bit lucky when I already finish getting my things, straight to the cashier (this time there's no queue at all), focusing the items that need to pay, turn around and gosh, saw so many people already queuing at the back! It's just a few minutes I tell you! 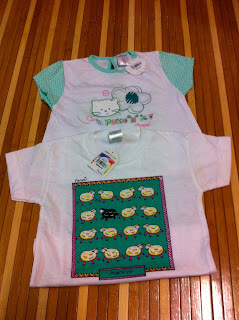 Above RM3 and below RM4. 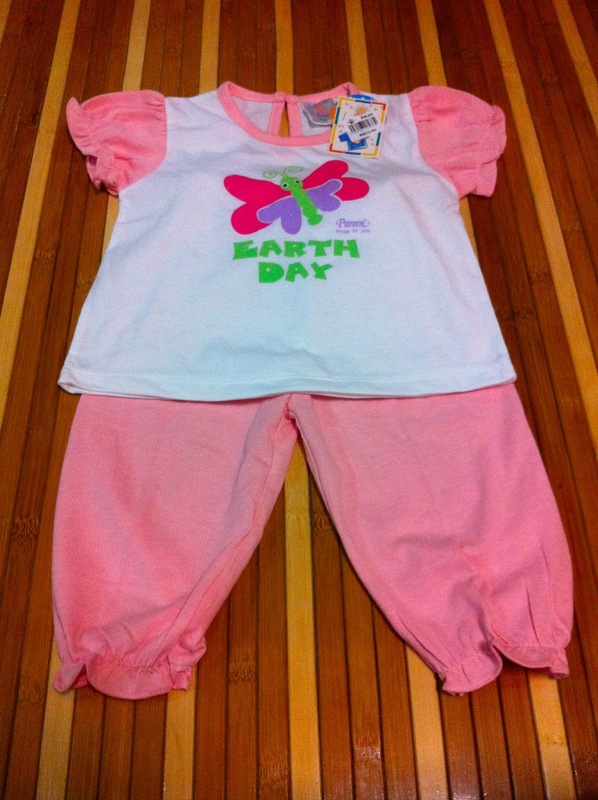 The rest was RM12 a pair - No skirt for Rauhah this time, nor the short pants above knee since she's crawling. There's a LOT (caps, red and bold) items in this warehouse sale. I am really restraining myself when buying here, like the breast pad - it's so cheap that I wanted to buy it until I realize that it wasn't absorbent as Bumble Bee's breast pad and I already bought it plenty during Mom&Baby Expo. 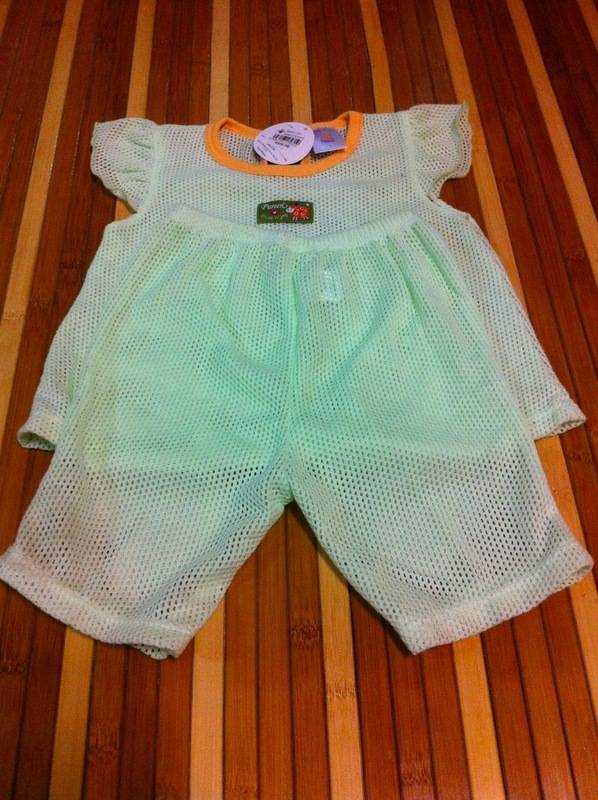 Another case was when I saw a nappy (can't remember the price but I think it's worth it) and thinking I MIGHT want to use it but I just tell myself, no cause the nappy is already enough. 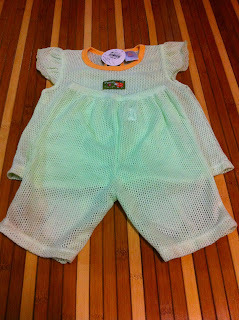 I fail telling myself that I dont need this cause it's cute. HAHA. Eventhough the price is super cheap, try asking yourself, do you REALLY need it? So shop smart my fellow friends! worth tang beli detergent tu je sbb tu priority. HAHA.